Mercury in Leo formed a semi-sextile to Venus in Cancer prior to these inner planets’ ingresses to Leo (Venus) at 10:58 am EDT and Virgo (Mercury) at 1:58 pm EDT, which demanded that we adjusted our personal plans to be able to take care of a relationship we want to nourish. Venus’ transit through Leo will last until August 21 and corresponds to a phase when we wholeheartedly respond to our personal, creative and self-expressive needs, whereas Mercury’s transit through the sign Virgo until September 25 due to an impending retrograde is associated with a time of mental analysis, thoroughness and discrimination when we focus on making the best use of our connections, on communicating effectively and improving our dexterity together with our capability to be flexible, adaptable and inquisitive. Although both planets will engage right away with Ceres Rx in Aries, Juno in Libra and Neptune Rx in Pisces, Venus in Leo will perfect these aspects today, adding more emphasis on the established flow with our desire nature regarding our Self-development within relationship dynamics after alignment of our unified vision as bits and pieces come together to initiate support and work out conditions for rapport. The Sun in Leo’s quincunx to Pluto Rx in Capricorn shifted circumstances in a way that led to a renewal of purpose, while Juno in Libra’s quincunx to Neptune Rx in Pisces shifted us onto common ground. 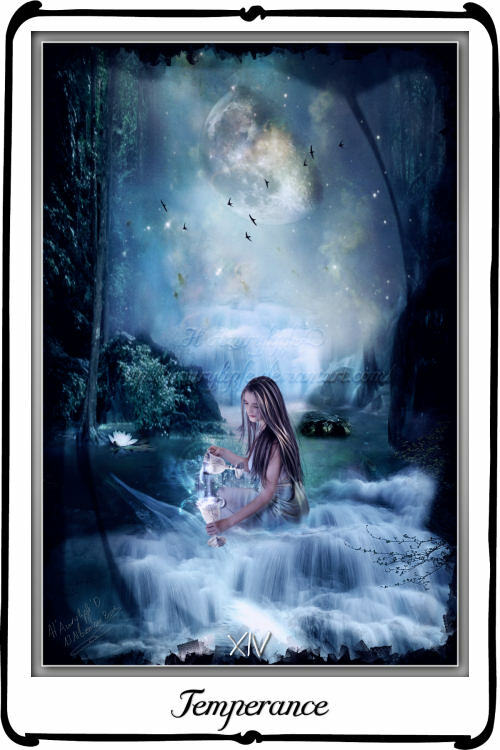 Tarot card of the day is the “Princess of Cups”, suggesting the redevelopment of an old relationship or the development of a present relationship to a deeper emotional level. This card is furthermore associated with the arrival of good news, increased intuition, reconnecting with source and rebalancing of energies. Personal Note: Christina called me this morning on Skype, while I was beginning to write this blog post. So, we’ve talked about the latest developments in our lives and about our creative endeavors in particular until our visions united at the time of Venus’ ingress to Leo, which inspired both of us greatly. At that point though, we had to leave the chat due to other things on our agendas. However, some of our plans or projects we’ve been fantasizing about for a longer time seem to finally materialize, which uplifted us on a feeling level and encouraged us to look forward toward teaming up. Vesta Rx in Aquarius’ sesqui-quadrate to Juno at the last degree of Virgo demands that we dedicate ourselves toward resolving a long-standing relationship situation that isn’t working for us, dividing us or putting us at the edge in some way. As the Leo Sun engages in the Chiron Rx-Uranus Rx semi-sextile with a quincunx and a trine, respectively, an adjustment in this regard can be made if we play our part without dramatizing the issue and make choices we can be proud of and that harmonize with our sense of Self, allowing us to instigate progress. Juno will ingress to Libra at 7:33 pm EDT, where she will be traversing until October 25, which corresponds to a period when we seek to balance relationship dynamics and assess relationship principles through poised, fair, conciliatory, peaceful and tactful means and by way of compromise, cooperation and collaboration. The Moon’s ingress to Cancer at 9:11 pm EDT and subsequent squares to Ceres Rx in Aries and Juno in Libra in addition to her trine to Neptune Rx in Pisces, will bring out moodiness, neediness and behavorial patterns of the past we can overcome with compassion and awareness of Self and others. Tarot card of the day is the “10 of Swords”, signaling the end of an issue. We may have hit rock bottom or experienced a loss or difficult release, but the worst is over now and the only way is up. It’s time to surrender and to allow the necessary changes to take place. We’ve reached the end of the Cancer lunation cycle that started out with a Solar Eclipse, which was the third and last of the current eclipse season. As this special New Moon fell into the 11th house of my natal chart in quincunx aspect to my natal Moon in Sagittarius in house 4 and in the 12th house of my Solar Return chart in opposition to Ceres in Capricorn in the 6th, my social creativity had to adjust to the many things on my private schedule, inclusive the unfinished business I was forced to take care of and on the resolve of which I’m still working. Thus, I fell a bit behind with everything, especially after the Full Moon event, which triggered my Sun/Moon midpoint in the natal 5th house, which actually reminded me about my creative intentions, getting me started on a project I had on my mind for a long time. However, came the Third Quarter Phase, appropriately termed the crisis in consciousness, the Leo Sun conjunct the ASC of my Solar Return chart was squared by the Taurus Moon. Not only was my creativity stuck, I also indulged and spoiled my inner child instead of expressing my creative side during the few hours of spare time I had left. However, at least, I dealt in a constructive way with the mental disturbance that’s been dominating this phase, when Venus in Cancer squared Eris Rx in Aries, Pallas Rx in Aquarius squared Jupiter in Taurus, Mars in Gemini sextiled Eris Rx in Aries and formed a lesser octile triangle with Pallas Rx in Aquarius and the nodal axis in addition to the waning Sun-Moon square, Mercury in Leo’s semi-square to Saturn in Libra and Vesta Rx in Aquarius’ semi-square to Ceres in Aries. Tough conditions with lots of problems and challenges to work through, indeed, yet a clarifier and eye-opener that confronted us with current realities or, in other words, the discordant mentality that defines our postmodern age, symbolized by Eris’ archetype. Norway, a peaceful, progressive country, where the criminal rate is minimal, was shaken by twin attacks (Mars in Gemini) on July 22 that left over 90 people dead, most of them young people in a popular summer camp (Mars in Gemini). A homegrown fanatic/psychopathic fantasist and narcissist (Venus in Cancer square Eris Rx in Aries, Pallas Rx in Aquarius square Jupiter in Taurus, the Aries Moon ruled by Mars and being dispositor of Venus, the Sun in the last degree of Cancer with the Sabian Symbol “A daughter of the American revolution” in this setup) prepared and carried out the attacks in the belief that these would launch a necessary revolution in the Western world with the specific aim to save Europe from Muslims. Extremism at its most exaggerated form coupled with radicalized self-righteousness. 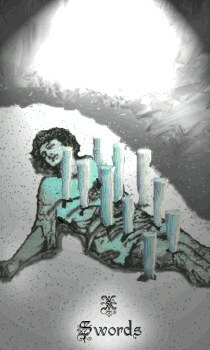 The end justified the means; his cause stood above everything else, allowing him to enforce his narrow self-interests and personal ideology with total disregard for others and in ‘cold blood’, immersed in an alternate reality his mind constructed for him that is ‘autistic’ in its nature and characterized by emotional detachment. a quincunx aspect with Neptune Rx in Pisces, was English singer Amy Winehouse found dead at the age of 27. When her mother last saw her the day before, she said that Amy seemed to be ‘out of place’. Her shining light has been fading for a while until it finally dissipated entirely. Energy depleted, like a switch being turned off (Vesta Rx in Aquarius semi-square Ceres in Aries). With the Leo Sun also in trine to Ceres on the Aries Point, where the “personal becomes political”, the suddenness and shock of these attacks and killings, especially of the children, would draw world-wide attention, while causing considerable grief and this would include a celebrity. Though not really surprising, considering Amy’s drug and alcohol history, her passing reminded us of other young artists who had died at that age and thus of the price of stardom in a culture marked by reckless competition, divisiveness and discord, where all kinds of drugs are used to substitute for a sense of wholeness and connection with the whole of existence. Tarot card of the day was “The Devil”, coming with the message “I can untie the binds and set myself free”, which Amy did as she escaped from this mad world. Meanwhile in the U.S. on Capitol Hill, the debt talks reached an impasse, because the leaders failed to find common ground during an exhausting, heated fight over the last few days between the two parties. At the end of the day, there were only harsh words, but no basis for compromise due to egocentric notions. All this entire debating has so far provided is an outstanding example of the divisive, discordant mentality, narrow self-interests and extreme selfishness (Ueber-individualization) associated with the lower vibration of Eris. With Ceres stationing retrograde today at the Aries Point as Chiron Rx in Pisces semi-sextiles Uranus Rx in Aries, developments seem to move backwards to the point where they began. Republican House Speaker Boehner misses the cuts target, which postpones the deficit vote, while Democratic President Obama threatens to veto the Speaker’s measures to increase the debt. I, for my part, am sitting here, struggling to compose this blog post, as I failed again to get inspired. Back to square one. My friend, who wanted to call me on Skype tonight, did once again not ‘deliver’. Back to where we started. Tarot card of the day is the “7 of Cups”, suggesting that a sense of illusiveness prevails. Millions are at risk of starvation in Southern Africa, because the aid caravan is too late. Nobody pays attention until the disaster has arrived. During the retrograde we have a chance to review and become aware of these developments as well as where our support is needed and where we have to end a cycle of self-undoing. A tense sesqui-quadrate from Venus in Cancer to Chiron Rx in Pisces can make us a bit touchy and therefore demands awareness of sensitivities in our interchanges with others to be able to bond and establish rapport as we have a chance to take advantage of the relationship opportunities presented to us, which nurtures the sense of Self we’ve been fostering, indicated by the Sun in Cancer’s sextile to Juno in Virgo. After the Moon’s ingress to Aries at 12:25 pm EDT and subsequent conjunction with Ceres in addition to her semi-sextile to Neptune Rx in Pisces, will the environment support our personal initiatives, while emphasizing our Self-development, which requires to tread carefully as we move ahead with our intentions. 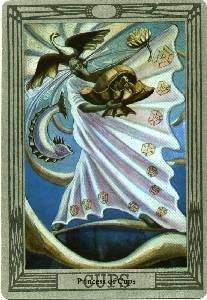 Tarot card of the day is “Temperance”, suggesting that careful control will bring success. This card brings a balanced, adaptable influence into our life. We are able to see both sides of a situation and are calm and in control, which allows us to resolve matters, sort out disagreements and solve disputes. Our inner voice is guiding us gently to the right outcome and we are patiently listening and following. We have set up a BlogTalkRadio show for 10:00 am EDT this morning to which we invited astrologer Kiril Stoyheff from Bulgaria to talk about how the Pluto-Neptune cycle factors in the harnessing of nuclear energy. However, in the proverbial last minutes, Kiril let me know about problems on his side. So, I’m waiting for Ed to come online to discuss this with him and see where we’ll be going with this. Here’s a link to Kiril’s blog: http://astrohoroscope.info/stoycheff/?p=49. I will post a link to our show as soon as know more. Stay tuned. Mercury in Leo’s trine to the North Node in Sagittarius signals the completion of a creative idea, project or course of learning ensuring our future growth through the meeting of our destiny. As Eris stationed retrograde at 22:29 Aries at 1:54 am EDT, mental energy is strongly concentrated, pushing our authentic Self to the fore. 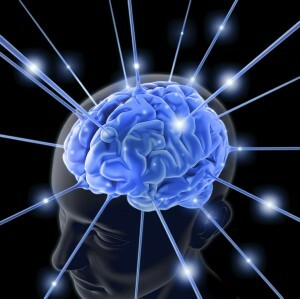 With this energy turned inward until January 10, 2012, we’ll be reviewing where our mentality is in discord and in dissonance with our sense of Beingness during this time. 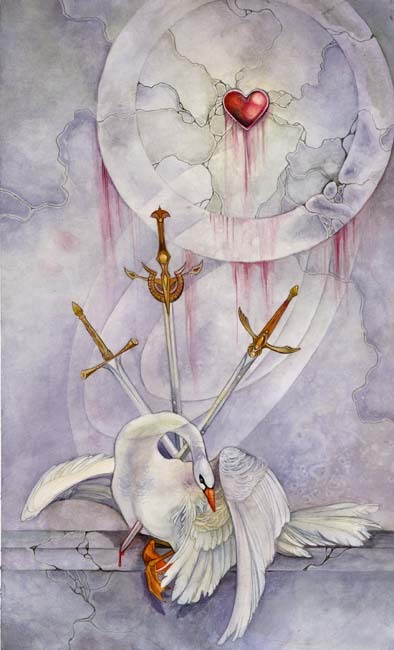 Tarot card of the day is the “3 of Swords”, a card that gets to the core of the matter. The tide is turning and the veil of obscurity is pierced. There could be an element of sorrow due to painful realizations. Consequently, we could feel crushed. However, the ability to balance core and supporting beliefs can lead to heartfelt breakthroughs in our lives. 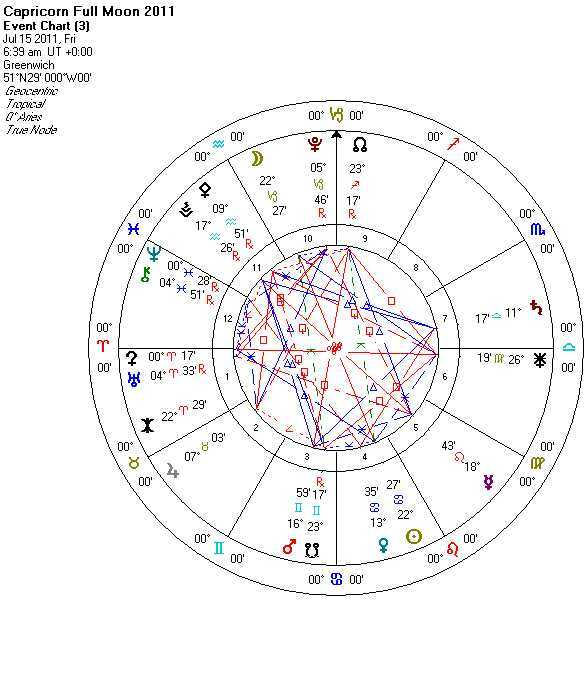 In the news: Media mogul Rupert Murdoch’s legal and financial woes escalate – the Media King (Mercury in Leo) is meeting his destiny (trine NN) that was long in the making (Sagittarius). The discordant, extremely competitive mentality (Eris) behind this man’s “success story” (Mercury in Leo trine NN in Sagittarius) is coming out from behind the veil of obscurity (3 of Swords), leading to painful realizations (3 of Swords). A prime example of selfishness coupled with mindlessness (Eris in Aries). The Solar Eclipse/Cancer New Moon culminated with the Full Moon in Capricorn at 2:39 am EDT, whereby the “craftsmanship” (keynote of the Sabian Symbol for the Cancer New Moon) as the seed impulse is being revealed in a measure of success and failure. With the lunation in square to Eris in Aries, professional standards and business practices have come under the illuminating light of the Full Moon, thereby showing the kind of mentality responsible for these acts and thus, the driving motivation behind the deeds. Consequently, competence, conduct and dependability have drawn attention, while reality has caught up with the past and we’re reaping what we’ve sown. Mars in Gemini, who was at the time of the Cancer New Moon in semi-square aspect to Eris in Aries, is forming a trine to Vesta Rx in Aquarius, implying that the course we pursued in our self-interest and the claims brought forward in this regard have set a process in motion in the name of our cause or rights that is now yielding results and this could turn out to be a double-egded sword, based on our intentions in this matter. Mercury in Leo, Mars’ dispositor, is leaving an opposition with Vesta Rx in Aquarius to engage in a tense sesqui-quadrate with her dispositor, Uranus Rx in Aries, which centered our focus on ourselves and stimulated our dedication, stressing the voicing of our message as well as the mobilization of the ego by directly addressing the issue and enacting our agenda. Starting with the Moon’s ingress to Aquarius at 4:29 pm EDT, moods and feelings will change, stirring up our inner life and alerting us to new developments or courses of action. The Sun in Cancer’s quincunx to the North Node in Sagittarius requires an adjustment to the life direction in order to support ourselves in the long term. Implied by these symbolical pictures is “a balancing of accounts” (elaborated by D. Rudhyar) as the next level of awareness and responses to challenging life situations has been reached. 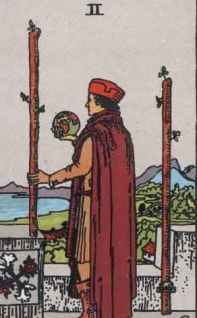 Tarot card of the day is the “2 of Wands”, ensuring victory over obstacles. An offer is about to be presented. There is something better on the horizon. This card shows the patience and focus of our intent. What has been set in motion will surely develop. Things start moving along and we begin to see them materialize. We have the power in our hands and need to be daring and courageous to use it. In the news: Rebekah Brooks resigned as chief executive of News International amid hacking scandal, which heaps pressure on Rupert Murdoch’s youngest son, who was too slow to realize the enormity of the phone hacking scandal. Saturday’s Venus-Jupiter sextile that offered an opportunity for steady growth and continuing validation, while permitting us to build upon previous success and appreciation, was succeeded by the Moon’s ingress to Scorpio at 2:31 am EDT, which intensified the fertile, productive atmosphere and climate of sharing and mingling. Another sextile between Mercury in Leo and Saturn in Libra enabled us to give form to our self-expressive ideas within the rules of engagement, whereas his opposition to Pallas Rx in Aquarius added a hectic social vibe, which required intelligent maneuvering. Because Uranus, dispositor over Pallas, stationed retrograde at 04:33:52 Aries at 08:34 pm EDT, some unexpected ‘attack’ or unusual event coming out of the blue, could’ve caught us off guard, thrilled, shocked or crazed us for better or worse. Consequently, the evening was either filled with joyful excitement and special occasions for some or could’ve caused mental disturbance for others. With the “8 of Wands reversed” as Tarot card of the day, we were warned of haste and being too eager or making sudden decisions. If things were forced or hurried or overseen due to the busyness we could’ve made mistakes or run into problems. There was a chance to get carried away. Uranus will retrace his steps to the Aries Point (00 Aries), where he will turn direct on December 10, which corresponds to a time when we review and inwardly process what we’ve initiated and started since March 11 when he re-entered Aries, especially in regard to our individual and societal causes. On Sunday did Pallas Rx in Aquarius perfect her trine to Saturn in Libra, which brought the issue or situation we had encountered and were still processing to a satisfying conclusion that evened out the frenzy. 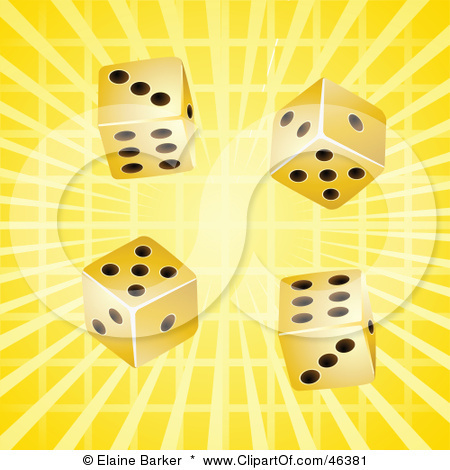 The Sun in Cancer‘s quincunx to Vesta Rx in Aquarius permitted us to adjust our spirit and energy accordingly. For this day I had drawn the Tarot card “Temperance“, which suggests that careful control would bring success. A balanced, adaptable influence was working in our lives and we were calm and in control, which allowed us to resolve matters, sort out disagreements and solve disputes. This was very true for myself. I had worked both days full time and when I was closing up on Saturday my manager approached me with proof of a transaction I hadn’t done. Understandably, this caused me considerable distress. So, for the rest of the evening was my mind preoccupied with this issue, while I was trying to ‘replay’ different scenarios in my mind, which would explain what had happened (Mercury in Leo opposite Pallas Rx in Aquarius). To my relief, the matter had been resolved the next morning and I could dedicate myself to my job as usual. My daughter and her boyfriend attended a birthday party Saturday afternoon and then went out camping on a friend’s large property, who had booked a band for the evening. They had a great time. What a difference! The Moon’s ingress to Sagittarius and subsequent square to Neptune Rx in Pisces this morning at 5:46 am EDT was quickly followed by Ceres’ into Aries at 5:50 am EDT. We may have woke up in time, but wished we could get back to sleep. However, we were most likely alerted to the reality of the situation and thus, to the things that needed to be taken care of, such as going to work, per example. Personally, I rushed downstairs as I remembered that I had forgotten to ask my daughter, who was about to leave, about directions to get to the dentist, where I had an appointment this afternoon (Ceres in Aries semi-sextile Neptune Rx in Pisces). Due to an impending retrograde, Ceres will be traversing through Aries until April 9, 2012, which is associated with the beginning of a new cycle that is defined by action aimed at taking care of things, fighting for the environment, struggles for support, initiatives for continuing growth and dynamic development as well as pushes for productivity, when we engage directly, determinedly and courageously in the unfolding of the events. Mercury in Leo’s sextile to Mars in Gemini opens the door for confident, willful communication, providing us with an opportunity to enact our plans or personal agenda quickly and persuasively. Tarot card of the day is the “6 of Pentacles”, which indicates a turn for the better, suggesting that we’re heading into a positive cycle and might actually be more successful than we had imagined. Success is gained through a combined effort or help from someone. The element of balance is emphasized and a purposeful intent may be made to stimulate response from our environment. Our tribulations may be ending; at least for now. – Well, that’s about right. My visit to the dentist seems to have paid off in more ways than one. Everybody was cooperative. I also got a call to pick up my portable airconditioner (Mercury in Leo sextile Mars in Gemini), for which I had gotten a rain cheque. It’s already assembled and running.